A 12-year-old passenger was killed almost instantly when his mother’s BMW collided with an oncoming semi truck. The wreck occurred on State Highway 60 at the Bailey Road intersection in Mulberry. Police and witnesses state that 38-year-old Carlos Colchado, of Fort Meade, collided with 29-year-old Maricela Resendiz, of Plant City, as she attempted to turn. The passenger side collision killed 12-year-old Miguel Resendiz and seriously injured the vehicle’s other occupants, including 4-year-old Angel Resendiz. All the occupants were properly restrained. Noncommercial motorists typically have a duty of reasonable care, which essentially means that they must drive defensively and obey the rules of the road. But truck drivers, taxi drivers, and other operators who transport people or services for a fee have a higher duty of care in Florida. These carriers are not insurers, but they are the next closest thing under the law. So, whereas a non commercial driver has a duty to obey the speed limit and maintain a safe distance, especially if a commercial driver sees that another motorist is about to make a left turn across traffic, that truck driver arguably has a duty to slow down even more and allow even more space. Because of the enhanced duty, it is easier to prove negligence in a Florida court. So, even if first responders determine, based on the limited amount of evidence available at the time, that the tortfeasor was not at fault, liability could still attach. One of the reasons there is a difference between accident fault and liability for damages is that, in a negligence case, the question is sometimes who had the last chance to avoid the crash as opposed to which party caused the car wreck. This legal doctrine is known as the last clear chance rule. Assume that the truck driver in the above story saw the car stop and turn on its blinker to attempt a left turn across traffic. If the truck driver failed to slow down or change lanes, he failed to seize the last clear chance to avoid the wreck, and he is therefore liable for damages in court. If nothing else, the driver’s behavior suggests that he is at least partially responsible for damages, under the contributory negligence rule. This doctrine essentially states that, if both drivers are partially at fault, the damages should be apportioned among them. Florida is a pure comparative fault state, so even if the tortfeasor was only 10 percent responsible for the crash, the victim still receives a proportionate share of damages. Scope of Employment: The tortfeasor must have been acting within the scope of employment at the time of the wreck. This phrase is very broadly defined and generally includes any activity that benefited the employer in any way, even if that activity was simply driving a vehicle that bore the company logo. Employee: Similarly, this term is also broadly defined to include anyone whom the employer controls, such as a W-4 employee, an independent contractor, an owner-operator, or even an unpaid volunteer. Foreseeability: The car wreck must have been a predictable consequence of the employee’s conduct, and a car accident is clearly a foreseeable consequence of driving a car or truck. Typically under Florida law, the judge apportions damages between multiple tortfeasors based on their percentage of fault, much like in contributory negligence cases. 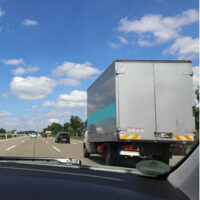 Large truck crashes often cause serious injuries. For a free consultation with an experienced personal injury attorney in Tampa, contact The Matassini Law Firm, P.A. Home and hospital visits are available.